Ok Dol (‘Jade Stone’) Bathhouse lies in a small square of bars and restaurants so I would imagine it is busy on certain evenings as it is a twenty four hour establishment. It has the usual peripheral businesses of barber and shoe shine and a television in the changing area. 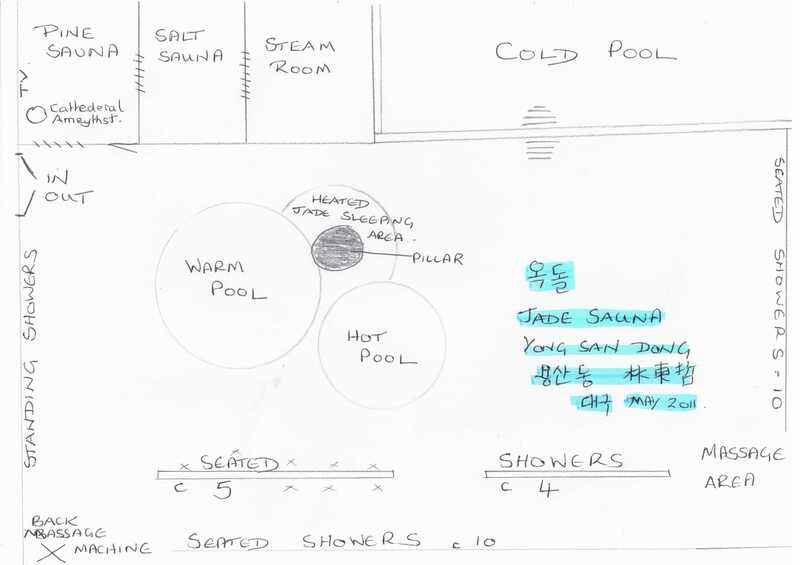 The bathing facilities are quite small and there are only three baths, a warm pool (온탕), hot pool (열탕) and a cold pool (냉탕). The hot pool isn’t too hot and the cold pool not too cold. Around these are about 12 stand up and about twenty sit down showers. There is also a small jade ondol (heated) sleeping area but it will probably only accommodate about 3 people. As for saunas, there is a steam room (습식 사우나), salt room (소금방) and a pine sauna (소나무방). The decor is pleasant with plenty of jade and dark brown tiling with sunken gold patterns running through it. The sauna rooms, pine, salt and steam are small but comfortable with ‘jeweled’ walls and ceiling containing plenty of jade and inlaid with slices of impressive geodes. The pine sauna contains a three foot, free standing ‘cathedral’ amethyst geode. The ‘powder room,’ my term for the room you dry and preen yourself in prior to dressing, was very small and I had to step over a number of used towels to enter the locker area but this is my only criticism. Most notable however, throughout my entire visit, was the fact an attendant continual cleaned, wiping down tiles, rinsing soap of mirrors and polishing the taps. The entire bathhouse gleamed. Facilities – Tickets on the second floor. 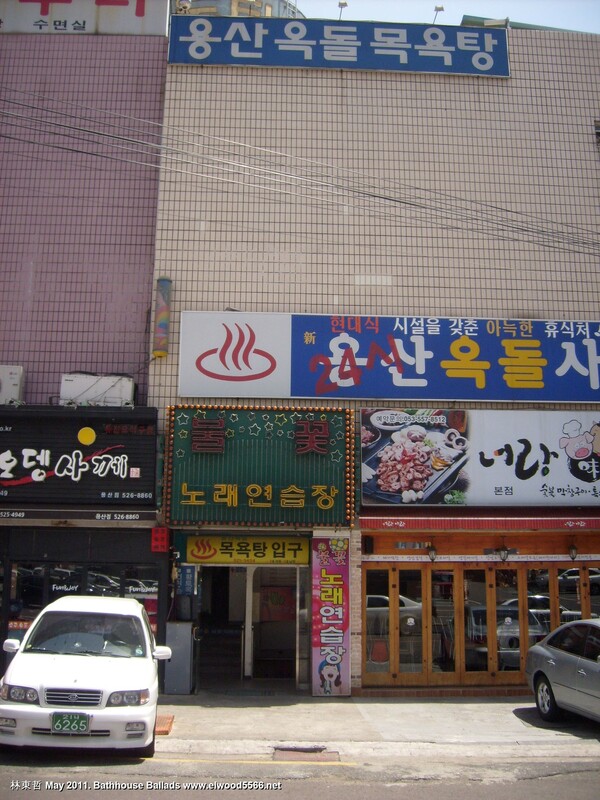 Bathhouse (men) – smallish with an event pool, (이벤트탕), small warm pool (온탕), and medium sized cold pool (냉탕), ‘jeweled’ steam room, salt room (소금방)and pine saina (소나무방) and a very small jade, ondol heated sleeping area. Changing room with television and benches. Cost – bathhouse 4500 Won. Others – shoe shine, barber. Many nearby restaurants and bars. Ambiance – more functional than relaxing, very clean. « If I Knew Your Name I’d Write it in Red!